We offer a wide range of hotels near Bristol Rovers from cheap accommodation to up market luxury hotels. Search our database of hotels to find the lowest rate for your stay closest to Memorial Stadium. This Holiday Inn Express Bristol North offers a warm welcome, free parking and modern facilities, just 5 miles from Bristol. The Holiday Inn Express Bristol North has air-conditioned bedrooms and Wi-Fi internet. With free private parking in the affluent Clifton area, this guest house is set in a beautiful Victorian Villa. Breakfast is made from locally sourced and organic produce and free Wi-Fi is accessible throughout. Built in 1869, this 4-star hotel is in the heart of Bristol city centre. It offers luxurious rooms as well as a bar, a restaurant and a leisure complex. The Holiday Inn Bristol’s amenities include 2 modern restaurants, a lively lounge bar, a leisure club with sauna, gym and a swimming pool and a private fishing lake. 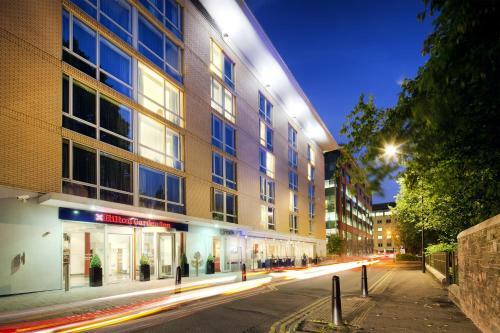 In the heart of Bristol city centre, Hilton Garden Inn Bristol City Centre is just 2 minutes’ walk from Bristol Temple Meads Rail Station. It provides a modern gym, free WiFi and a 42-inch flat-screen TV in each room.